Intalytics believes that the key to any analytical effort is having a robust foundation of data upon which customized solutions can be built. We take an agnostic approach to data, ensuring that any valued third-party relationships with compilers can be maximized to their fullest extent. Ultimately, we want to ensure that the highest quality data are leveraged on your behalf, and we are proud to partner with a variety of best-in-class data compilers across a spectrum of data-related needs. Third-party data will be supplemented by all relevant internal datasets that you can provide to us, including data about your existing locations (including each location’s site and situational characteristics), the consumers that you serve, your current performance, survey-based insights, and your current investments in marketing and operations. 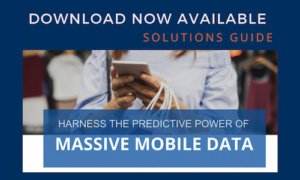 When clients lack known data about the consumers that they serve, Massive Mobile Data becomes a critical piece of the larger information puzzle. Intalytics has revolutionized the analytical use of Massive Mobile Data when solving for real estate and marketing-focused needs. Through our partnership with Cuebiq, we have access to location insights for tens of millions of opted-in, anonymous consumer in the U.S. alone. Intalytics leverages these location insights by combining our custom geofencing capabilities and third-party datasets, to generate actionable insights, including quantifying their demographic and psychographic makeup. For organizations seeking dynamic solutions to interacting with information, SiteIntel serves as a powerful mechanism for visualizing meaningful data spatially, generating site-specific insights using custom models, and importing/exporting information for real-time analysis. Clients that we have the good fortune of serving can attest to the value of their partnerships with Intalytics and the measurable benefit that our consultative guidance and customized solutions provide.